Linking community service to academic learning is a hallmark of a McKendree University education. The University believes volunteerism promotes intellectual development, a sense of social responsibility and active citizenship. One of the easiest ways to get involved is through weekly volunteer opportunities offered by the Lyn Huxford Center for Community Service (CPS) on campus. Among the most popular is Bridge the Divide, directed by David and Cortland Hendrick at Cornerstone Farms in St. Jacob, Ill. The non-profit organization provides opportunities for children with special needs to ride and help care for horses at no cost. For children with Down’s syndrome, autism or cerebral palsy, the experience can be meaningful, therapeutic and sometimes lifechanging. Bridge the Divide operates year round, giving over 130 free lessons each month. The organization relies heavily on volunteer help - much of it from college students. Jennifer has observed mutually beneficial relationships that develop when special needs children and student volunteers connect. 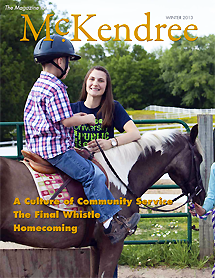 McKendree students can really make a difference in these kids’ lives, she noted. More importantly, they should be open to learning from the children and how they can impact their lives. The elementary education major plans to obtain a master’s degree in special education. “I have such a passion to help children with special needs,” she said. Jennifer estimates she has volunteered 100 to 200 hours a year since she started college. Growing up, becoming involved in Girl Scouts and Corpus Christi Church in Shiloh, Ill., drove her volunteerism and showed her how rewarding helping others could be. She continued Girl Scouts through high school, eventually becoming eligible for the Girl Scout Gold Award, the highest and most prestigious achievement in scouting. Through a seven-step process, it challenges a Scout to make a positive change or solve a problem in her community, both short term and long range. Only 5.4 percent of eligible Girl Scouts successfully earn the award. For her community project, Jennifer organized the Shiloh Easter Egg Hunt as a high school senior. “I saw a need in my community, she said. “The village had a couple of years of struggle to fund the hunt for the town.” Many residents volunteered their time and donated about 10,000 pounds of candy, and 300 kids participated. As a Gold Award recipient, Jennifer is part of an elite group of women who continue to inspire other girls to make a difference in their community. She continues to serve as assistant co-leader of O’Fallon, Ill., Girl Scout Troop #541. Jennifer is also a Golden Apple Scholar, a program that recruits and prepares bright, talented students for successful careers as teachers in high-need schools throughout Illinois. By the time they begin their first teaching job, Scholars acquire over 700 hours of classroom experience in poverty-stricken schools. She travels to Chicago every year to observe in a school where over 85 percent of its students live in poverty. “It really puts a different perspective on things,” she said. “Doing this has made me more aware about how to treat students. You never know what may be going on at home.” As part of all Golden Apple Scholars’ commitment, Jennifer must teach at an Illinois school of need for five years after graduation, within eight years of earning her degree and teacher certification. She believes it will prepare her for lasting success in some of the most challenging teaching environments.